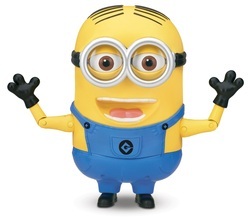 The Minion Dave talking action figure is based on the adorable character in the movie Despicable Me 2 from Universal Studios. The hilarious character also appeared in the original Despicable Me movie, and is very popular with children who have seen those animated 3-D films. Dave is about 8 inches tall, and the interactive, battery-powered doll delivers specific actions and responses when you activate or touch certain areas on the toy. Let us take a closer look, and see just what Minion Dave has to offer your child. 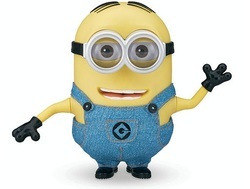 What Makes the Despicable Me 2 Minion Dave Talking Action Figure a Great Toy? One of the three talking minions which are available in the Despicable Me 2 toy lineup, Minion Dave has a "banana mode" that your little ones will absolutely love. You might even laugh to when you press on Dave's tongue, and he responds by saying "Banana!" and then greets you with a disgusting fart when you move his head or push his pocket. Definitely not high-brow entertainment, but kids just love it. That is just one of several different interactive deliveries Dave has to offer, and the "super banana mode" requires your child pressing on his tongue twice. Yes, as expected, another even louder fart is delivered here! There are also dozens of different sayings and noises which your child will remember from the 3-D movies starring Dave, and it is really nice to have a toy deliver a movie voice accurately. Also, as a parent, it is nice when you hear a different, unique saying every time. Dave does not just recycle a few sayings over and over. The audio recordings are really high quality, and though the toy is durable, it is made with a soft touch rubber skin that children love to touch and cuddle with. Dave is flexible when you move him around, and his eyes move left and right, open and close, so your child feels like Dave is a playmate, and not just a toy. Not just for children, this would make a great addition to anyone with an officially licensed movie memorabilia collection. 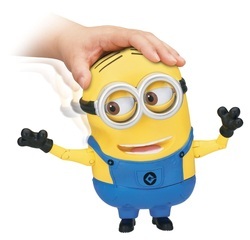 If your child is a big fan of the Despicable Me movies, then the Despicable Me 2 Minion Dave Talking Action Figure is a great toy selection at a mid-level price. Bello! Here's your quick guide to what your Minion is saying - and how to speak back in genuine Minion!